Maytag Bravos dryer error codes are shown on your dryers display to help you troubleshoot the problem with your dryer. 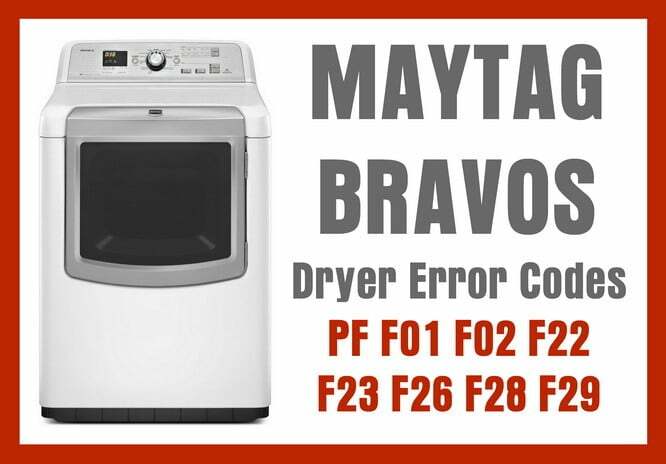 Our error codes below will help you to identify what is wrong with your Maytag Bravos dryer. Once you have identified the error code, this will tell you which part is causing the issue. You can then check the part in question and clean or replace it if needed. Maytag Bravos dryer help videos are here if needed. Check or Repair Needed = Remove power from the dryer. Use a multi-meter and check the resistance of the thermistor (0,000 ohms). If the thermistor is bad then replace it. Check or Repair Needed = Remove power from the dryer. Check wiring connections between the main electronic control board and the drive motor. If the wiring connections are not damaged and connected then replace the drive motor. If your Maytag Bravos Dryer error code is not listed here or you have issues with any Maytag Bravos Dryer Error Code, please leave a comment below and we will be happy to assist you with your dryer error code problem. If you have a different Maytag Dryer, you can ask error code questions about that model dryer also and we can further assist. We have a Maytag Bravos that is not showing an error code but still doesn’t work. When turned on as usual, by pressing power, selecting the dryer setting (right now it’s a 24 minute rapid dry), pressing start and the dryer beeps when I press the button but will not spin. The light above “sensing” is lit and the timer counts down as if it’s running a normal load, but again it doesn’t spin. We’ve checked both buttons in the door lining and they’re fine and working. Any advice is greatly appreciated since it’s Saturday and we have work and school on Monday. My power went out briefly the other day. My dryer flashed what I believe was F73 exactly when the power returned. I have not been able to reproduce the code. My timer will not come on unless I turn the dial to steam. The dryer will not come on but all other lights and noises work. Any ideas? My bravos dryer when started stays on “sensing” for 30 seconds. It then repeatedly flashes a “F” then a “1” but will not run. The error codes listed in my owner’s manual and on the website identify a solid “F01” error code, but not an alternating “F” and “1”. Are they the same? We have the Bravos XL washer/dryer set, and our dryer is giving us from time to time codes e03/f03 alternating, and sometimes will not dry a load, but can restart and will continue to dry. Cannot find any info on these codes, other than maytag says when e code followed by f code to contact a maytag service person. Any help will be appreciated. Have a Maytag Bravos XL dryer that won’t run. I can’t figure out how to find the error codes. How do you get them to be displayed? I own a Maytag MVWB800VQ0 washer (8 years old). When I go into the diagnostic mode using the 3 seconds on 3 seconds off, 3 seconds on, 3 seconds off, 3 seconds on method, and after all the lights come on and the 88 appears, I get an error code that was stored in memory. The error was fixed and the machine runs fine now, but when I go into the diagnostic mode the error is still showing up. Unplugging the machine for 1/2 hour did not erase the stored error code. What button sequence do I need to use to erase all old stored error codes? How do I clear the stored error code in memory on this machine? Can you tell me the Error code F65 on Maytag Bravo 300 series? Our Maytag Bravos XL has not given us a code. It just has three orange dashes across the display window on half of the cycles. I is working on the others but the times seem off. Not sure how to re-set it as there is nothing in the manual. My dryer never quit so when I checked it was blinking 1:39 and clothes still wet. Smelled like it was getting hot and smelled moist. My son pulled it out, hose was clear. Will replace hose and hook back up, kind of cracked and pulled apart when checking it out. Not the typical codes listed so not sure. Will replace hose, hook back up and try it unless you have some suggestions. We have a Maytag dryer that is an older model, and the problem that we started having with it was that it didn’t heat the drum, so we took upon ourselves to change the thermal fuse. We replaced it, the drum cannot turn so now we’re having that issue. On my Maytag Bravos Dryer, I get an error code F:AO then CO for the second code. Dryer will not start. Can’t find these codes anywhere. What are they? Can I clear the codes/reset the dryer and try again? The error codes F:AO then CO you have on your Maytag Bravos Dryer are not common. Can you please supply us with the exact model number of your dryer so we may research this issue further? 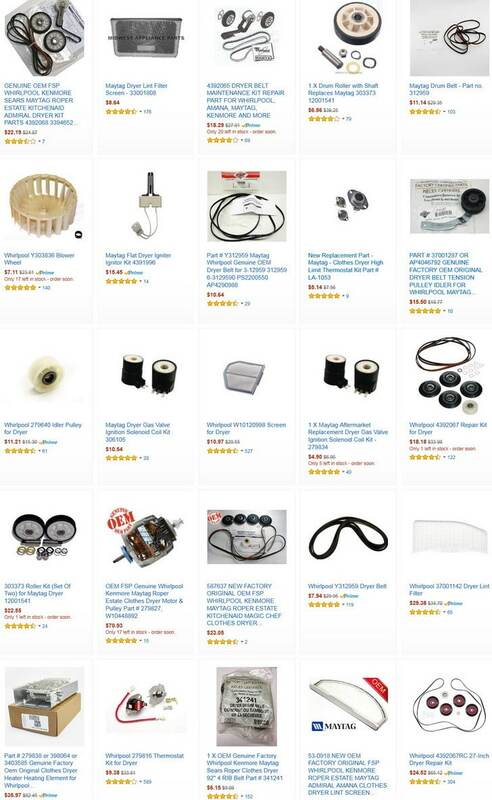 Previous post: How To Tell If Your Electric Hot Water Heater Is Bad?